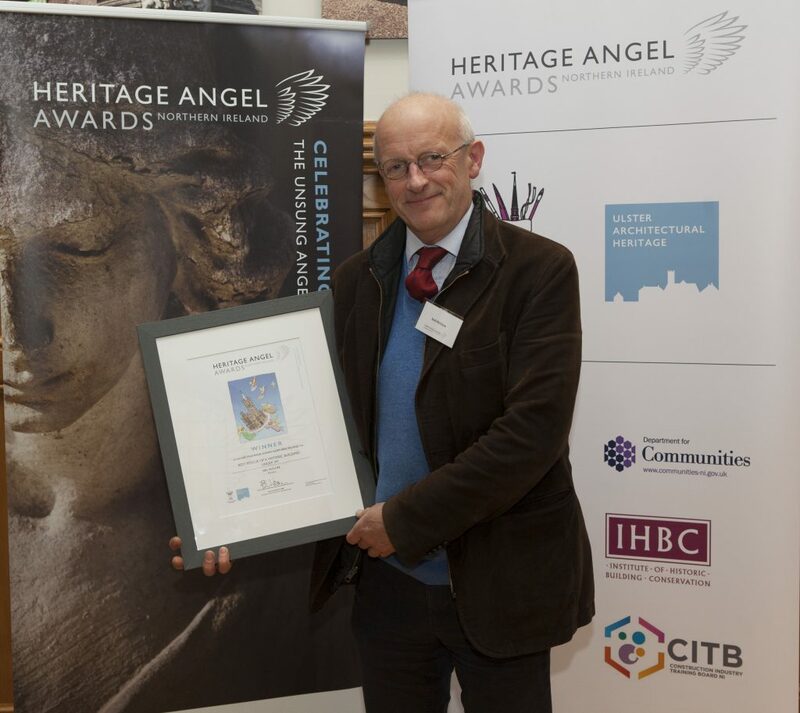 The quest for the 2018 Northern Ireland Heritage Angels came to a conclusion on the evening of Tuesday 6 November with the presentation of seven awards at a glittering ceremony which took place in the Guildhall Derry~Londonderry. 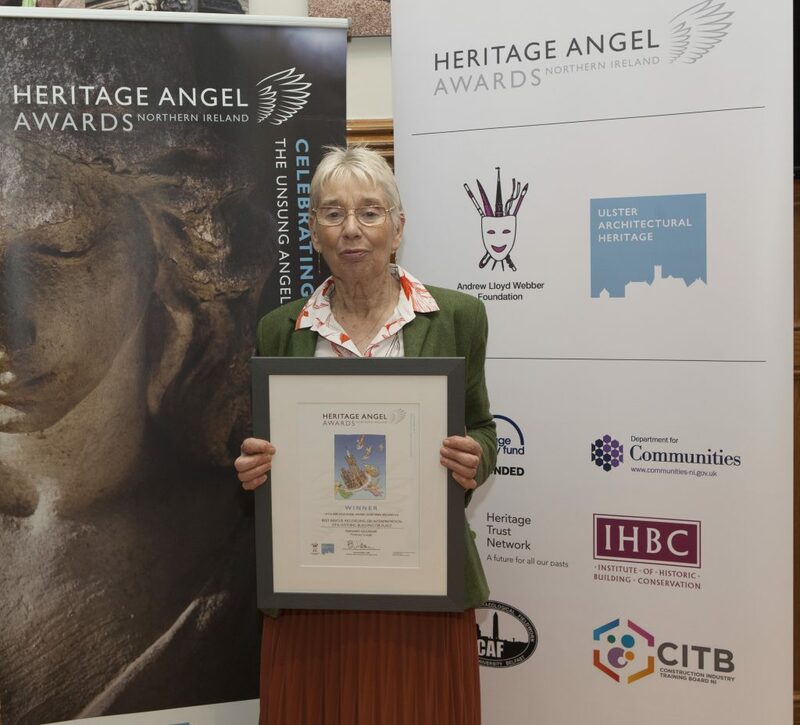 The awards funded by the Andrew Lloyd Webber foundation with further support from Derry and Strabane District Council and the Department for Communities celebrated individuals and groups who have rescued historic buildings or sites, worked as craftsmen or apprentices, or recorded and interpreted historic places. The ceremony was hosted by Wendy Austin, Journalist and BBC Presenter and featured entertainment by local artists including Brigid O’Neill, Eilidh Patterson and Eoin O’Callaghan who collaborated on Heritage in Song an initiative partially funded by the Honourable The Irish Society and the Acorn Fund. Material included bespoke compositions on the Derry Walls; Austin’s Department Store and the City’s shirt factory industry. Local writer Glenn Patterson also provided a reading on the theme of place. Guest presenters included John Kelpie, CEO, Derry & Strabane District Council; Dr Bob Brown, Chair National Trust NI; Dr Malachy O’Neill, Provost Magee Campus; Mark Patterson, BBC Presenter; Professor Deirdre Heenan and Joe Mahon, Less Spotter Ulster Presenter. Portaferry Presbyterian Church c1841 remained unchanged until 2015 when its restoration commenced. Friends of Portaferry Presbyterian Church (FPPC 2007 to rescue the church). Under the leadership of Neil McClure, FPPC acquired the church, established it as a Grade A listed building and raised £1.6m to carry out necessary restoration work. Challenges faced included ensuring that all aspects of the renovation were in keeping with its Greek Revival style, whilst weaving in modern technology. Neil guided an innovative concept of space sharing between congregation and community. The building is now an arts and heritage centre. In addition to holding church services, 5000 people have attended events in Portico in the last year. A legacy of the troubles is the destruction of historic buildings around Derry’s walls. Repairs were perceived as a short term measure with owners aware of the possibility of further damage. It was against this backdrop that the THI scheme emerged, recognising that Derry’s built fabric was an asset to the city. 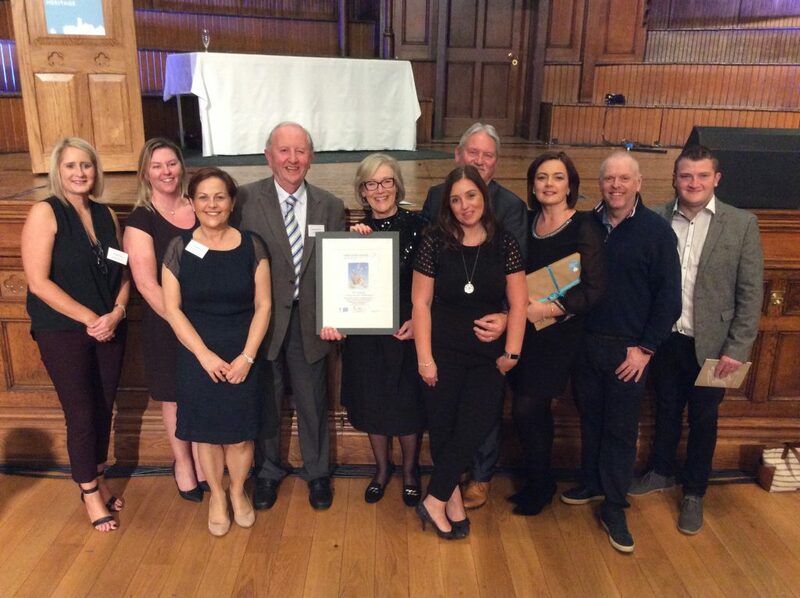 Initial success in securing support from the Heritage Lottery Fund by the project instigators, the Foyle Civic Trust, supported by its statutory partners, led to the development of the Walled City Partnership Limited, working to create a fantastic city centre to visit, work and live. As of June 2018 the THI will have facilitated the repair and restoration of over thirty historic properties. Lissan House & Demesne is a Historic Country House which was rescued from the brink by the foresight of its last owner Hazel Radcliffe Dolling, who formed a trust to turn her ancestral family home into a visitor attraction at the heart of the local community. Lissan would not function without the help and dedication of its volunteers. 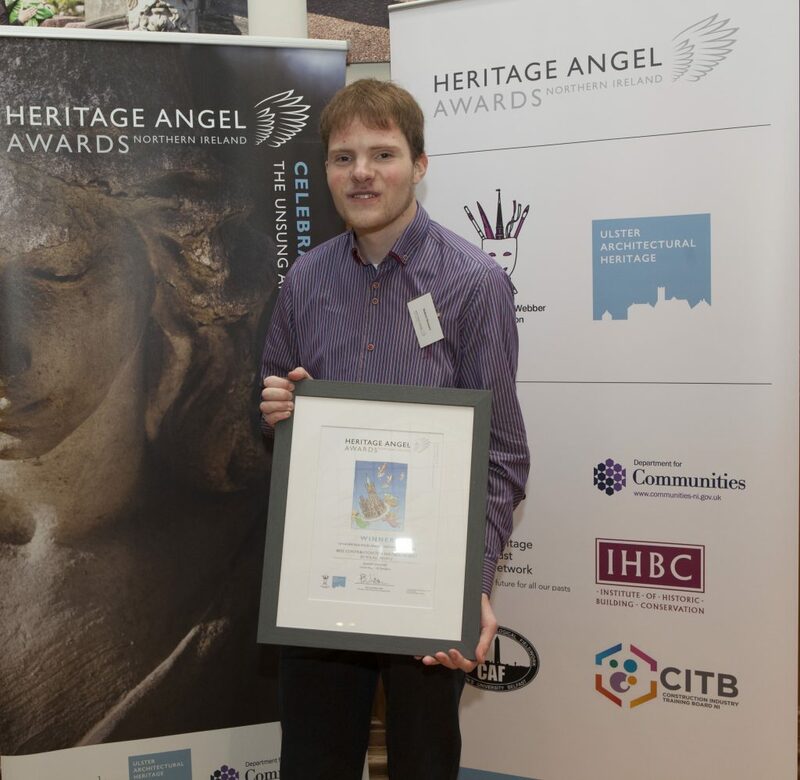 Twenty –two year old Robert Stewart is a passionate, dedicated and enthusiastic young man who has devoted himself to helping to secure the history and heritage of the House and Demesne for others to enjoy. He came to the house as a visitor and was so taken with the story of the family and the importance of the House that he signed up immediately as a volunteer. He has always had a passion for history and historic houses, and the fact the house is still an ongoing project, made Robert want to help in any way he could. He spends his free time volunteering, helping out with events from Murder Mystery nights, to cleaning the Victorian Kitchen or photographing the estate in the depths of winter snow storms! Sperrins Gateway Landscape Partnership was a £2 million scheme that aimed to ensure the natural, cultural and built heritage of the Sperrins would be safeguarded for future generations. The partnership included the ‘Up for Work’ work based training programme where participants gained experience and accredited qualifications. This included heritage skills for preserving listed buildings, stonemasonry, brickwork or earthen structures. Overall this project has resulted in a number of successful outcomes for participants and the heritage of the area. The value of small built historical features that give an area its character has been established in the perception of the local community. Margaret has actively, for over 50 years, maintained her traditional cottage and a way of life which otherwise may have been lost or forgotten and welcomes visitors, locals, school groups, media and all who are interested into her home. This has aided the active interpretation of architectural heritage but is keen to stress that it is not a museum rather it is a home. A visit to Margaret at Mullylusty – cake that has been baked over the hearth fire, knees burning from the heat- the atmosphere, the smell, the spirit of the vernacular- is not something anyone, young or old is likely to ever forget. Ormiston House was built in 1867, by Scottish architect David Bryce, as a family home for James Combe who was a Scottish merchant and the owner of the Falls Iron Foundry. The house went on to play a part in many other lives over the years. Some of its many inhabitants included the chairman of Harland & Wolff Shipbuilders, Lord William Pirrie, as well as boarders from a local boys’ college and it also housed the Royal Ulster Constabulary. 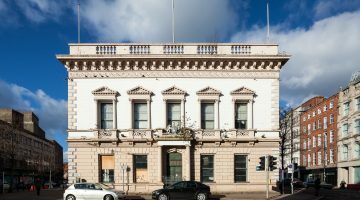 Thereafter it lay vacant for around 20 years, falling into a state of extreme dereliction and disrepair, having suffered extensive water ingress and vandalism which caused damage or removal of many original features prompting it to be identified as a building at risk. After the couple bought the property, the restoration took around three years to complete. Ciara and Peter engaged Northern Ireland professionals to carry out the works and make it into a comfortable family home fit for 21st Century living, whilst being anxious to respect the history of the building. This includes the roof being rebuilt using the original tiles where possible, windows were restored rather than replaced, missing ironmongery was cast using original methods, and original ceilings were retained. Where feasible all original materials were preserved and reused or replaced like for like. 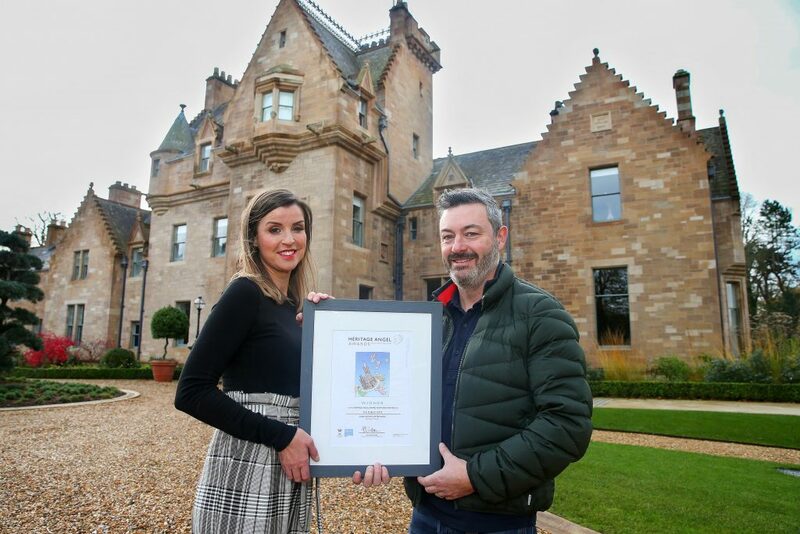 As well as returning Ormiston House to being a family home, Ciara and Peter hope that it can be preserved for another 150 years for future generations to enjoy. 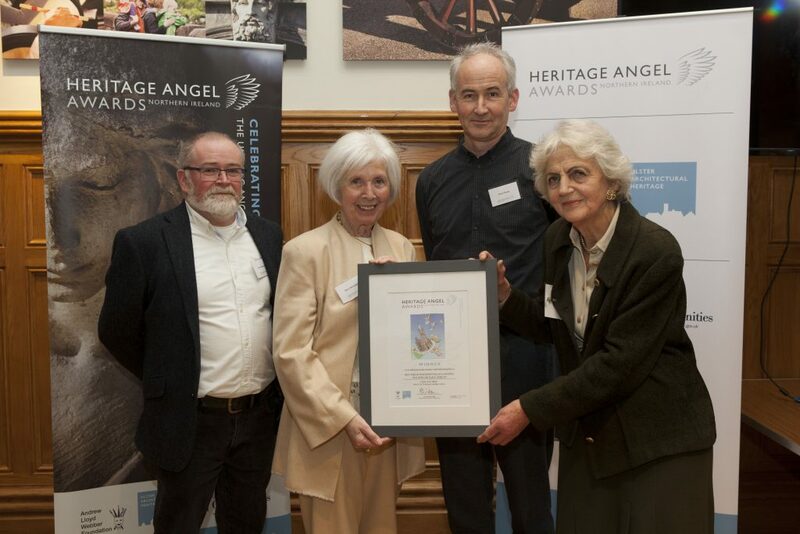 Please see here for further details on the Heritage Angel Awards as well short films on each of the winners.